In Europe, there are two manufacturers backing the custom scene hard: Yamaha and BMW. They’re supplying bikes to leading builders, and taking a leap of faith and giving them free rein. 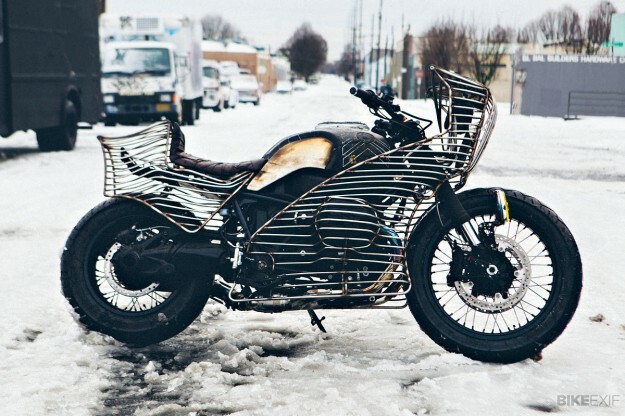 We’ve covered Yamaha’s ‘Yard Built’ bikes already, and now it’s the turn of BMW. 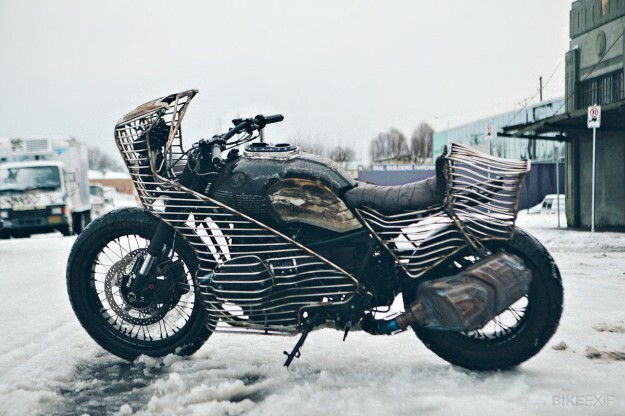 The Germans have commissioned four R nineT customs, and this is by far the most extreme. 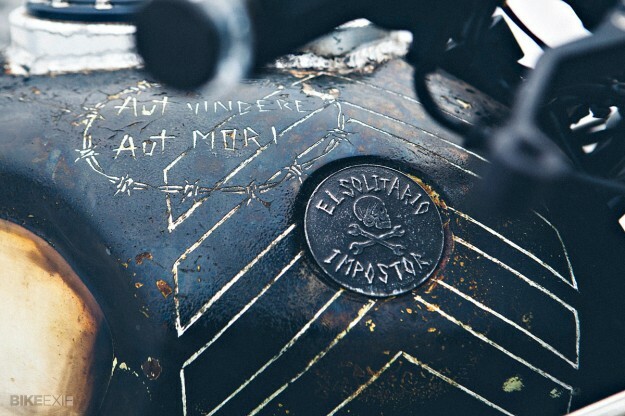 ‘Impostor’ is the work of El Solitario, the Spanish collective of accomplished mechanics who happily zig when others zag. 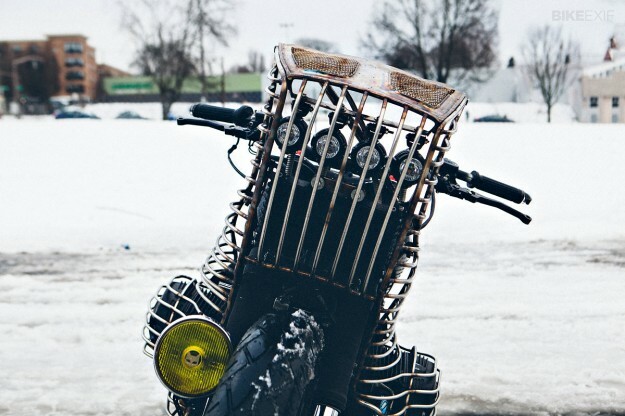 It’s impossible to pigeonhole the work of David Borras and his crew on the Galician coast, but they’re calling this bike a “Bōsōzoku-Chopper-Racer,” a nod to the most outrageous of all the Japanese moto subcultures. 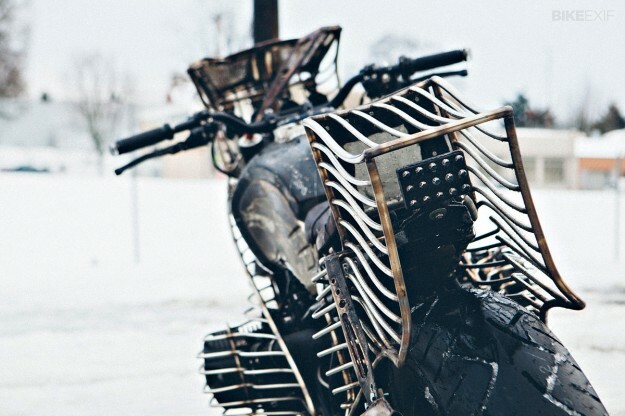 The look is raw and mechanical and like nothing that has gone before. These days, El Solitario bikes are designed to work off- as well as on-road, so Impostor gets a dirt-style 21” wheel up front and a chunky 16” hoop at the back. Adjustable S1000RR forks provide a smidge more control than the standard units, and the controls and instruments are a smorgasbord of parts from ISR, Chopper Dave’s and Motogadget. Illumination comes from a rack of four long-throw LEDs plus a classic wide-beam Marchal fog light. But it’s not really about the technical side. 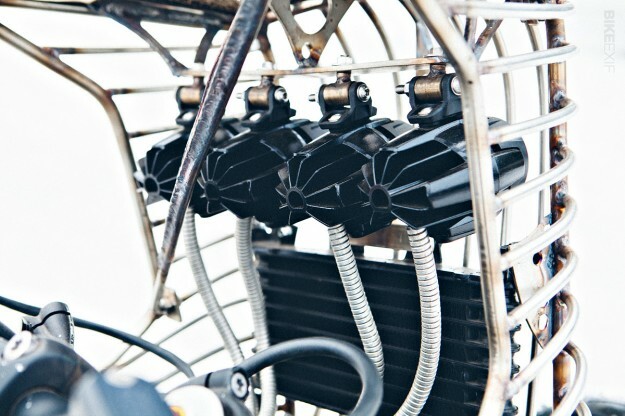 It’s about those stainless steel rods, fashioned into a see-through fairing and tail unit and curving snugly around the boxer cylinders. El Solitario can craft a resto-mod as well as any boutique Japanese builder—just check out the amazing Baula—but this time they’ve gone for visceral rather than slick. “Creepy, powerful and determined,” as Borras puts it. “With our motorcycles we look to create an impact on the viewer, and this does not necessary mean to please their eyes,” he says wryly. If there was ever a motorcycling equivalent of a short, sharp shock, this is it. Images by Kristina Fender. Head over to Vimeo for a short film on the building of Impostor.